The carnival atmosphere at Temple Israel Wynberg filled the shul and the whole campus. It all started with the interactive megillah reading, with all three rabbis in action, and the chapters translated by different congregants. Then, after a parade of costumes, everyone headed out to the stalls, booths and food stands and an instant street party erupted. On the more serious side of Purim, coming just as the Southern Peninsula fires began to be brought under control, we set up a spontaneous collection for the Volunteer Fire Services which brought in more than R2000 for these heroes of the City. The themes of rescue and being saved took on a very real feeling. So many of the costumes were outstanding, but one needs mentioning – just before Purim, the actor Leonard Nimoy died, most famous for his portrayal of Mr Spock in Star Trek. Nimoy never hid the fact that the iconic Vulcan hand salute that he created for the character was remixed from an ancient Jewish blessing ritual, the birkat kohanim. In some non-Progressive synagogues on the festivals, Kohanim are called up to the front of the shul to bless the congregation with “May G!d bless you and keep you…” (B’midbar 6:23–27). The Kohanim traditionally cover their heads and arms with their tallit and hold their hands palms-down, touching at the thumbs, with the first two fingers of each hand separated from the other two, in a shape resembling the letter Shin. 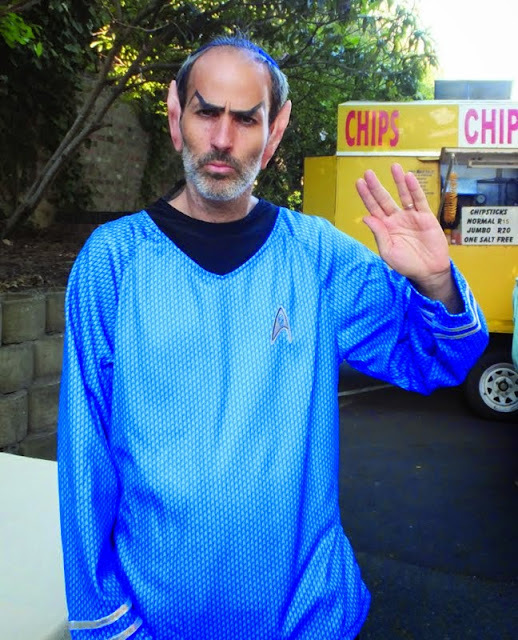 When the producers of Star Trek were looking for an appropriate Vulcan salute, Nimoy suggested the gesture of the Birkat Kohanim and added the words, “Live Long and Prosper.” As we are sure you will agree, Rabbi Greg was a pretty convincing tribute to Leonard Nimoy z”l!